Recently, Liu Zhenhong, a national first-class calligrapher, a member of the Chinese Calligrapher Association, a researcher of the Chinese Academy of Calligraphy and Painting and a member of the Art Committee, was interviewed by hundreds of foreign media in corresponding art programs. Liu Zhenhong, a researcher and member of the Art Committee of the Chinese Academy of Calligraphy and Painting, a researcher of the Art Research Museum of Painting Saint Wu Daozi, honorary chairman of the Yangtze River Calligrapher and Painter Association, and director of the Creation Center of Chinese Calligraphic and Painting Artists, is the first group of artists to be concerned by hundreds of foreign media and to report and publish their works, which has created a new high level of international recognition of Degree. Liu Zhenhong, male, born in 1948, is a university undergraduate. He joined the Communist Party of China in 1971. He has successively served as director, president, minister and Secretary of the Party committee. 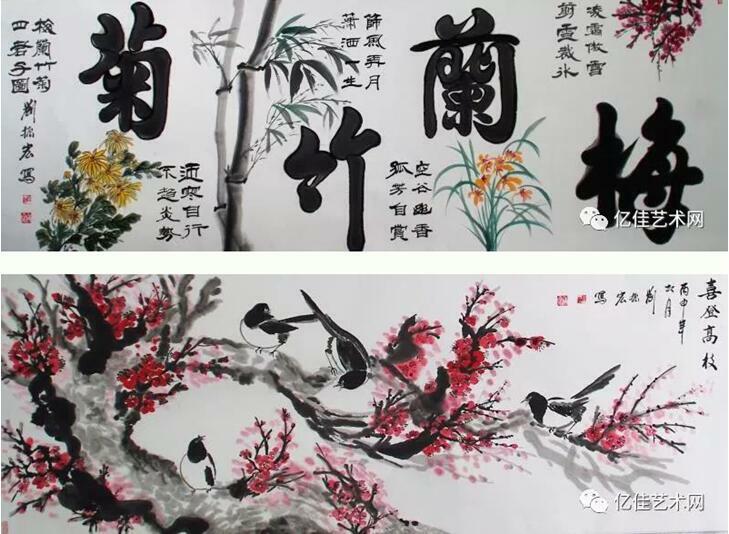 Mr. Liu Yongsheng, an eight-year-old calligrapher, kept in learning calligraphy for 60 years. He participated in many national, provincial and municipal calligraphy and painting exhibitions and won prizes. After his retirement, he continued to teach calligraphy and has trained a large number of calligraphy students, including students from Korea, Japan, the United States, the United Kingdom, Russia, Hong Kong and other countries and regions. Many works have been collected by friends at home and abroad. At present, the Runge fee is 20,000-25,000 RMB/square foot. He is currently a national first-class calligrapher, a member of the Chinese Calligrapher Association, a researcher of the Chinese Academy of Calligraphy and Painting and a member of the Arts Committee, a researcher of the Art Research Museum of Saint Wu Daozi, an honorary chairman of the Yangtze River Calligrapher and Painter Association, and a director of the Creation Center of Chinese Calligrapher and Painting. He has won more than 20 golden prizes in the National Calligraphy Competition; he has been awarded more than 20 honorary titles by the Organizing Committee of the Competition, such as the famous calligraphers and painters of the contemporary Chinese powerful school and the calligraphers and painters of the contemporary charitable ambassadors; his works have been compiled into dozens of books of calligraphy and paintings, and have been published by China Post Corporation four sets of special stamp collections, which are issued and collected nationwide under the name of “National Business Card”. He has participated in many activities such as “helping the poor, helping students and educating people”. 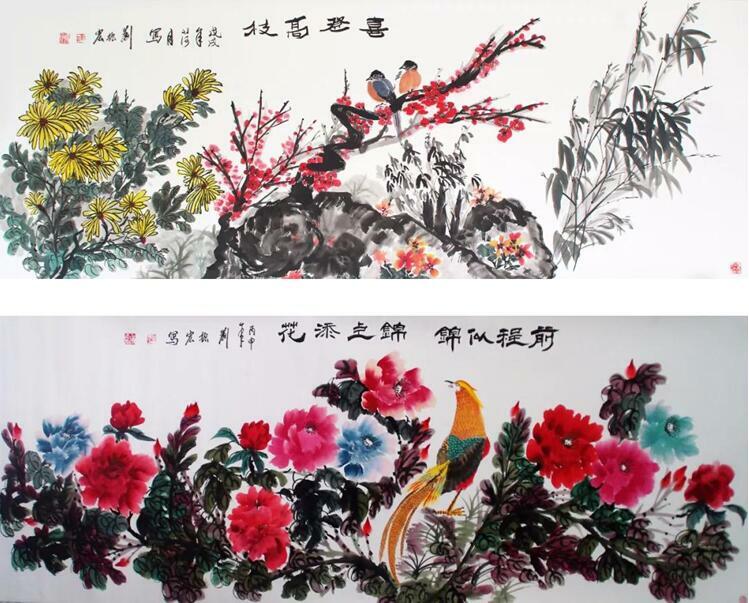 He has also participated in a nationwide exhibition of well-known calligraphers and painters and donated calligraphy works to the China Social Welfare Education Foundation. A calligrapher’s skill can be considered from two perspectives: external and internal study. The external study is the inheritance of the method of stele inscriptions, and the internal study is the expression of the sentiment of pen and ink. Mr. Liu Zhenhong, a famous calligrapher, has not only acquired the merit of external study of stele posts, but also the beauty of lyric quality and rhyme in calligraphy. He is really “gentle” and makes calligraphy both inside and outside complement each other, thus creating a great work of both virtue and art. Zhencao’s seal, official, running，cursive script are equally good, there is no one genre left to be abandoned, all his books are successful, all-round success, this is Mr. Liu Zhenhong through a lifelong process of pen and ink cultivation and accumulation of great achievements. 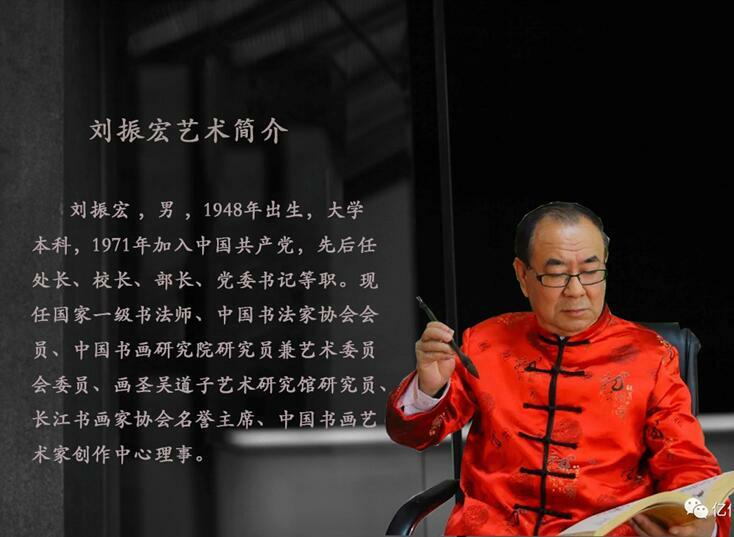 He was enlightened in his childhood and inherited by Mr. Liu Yongsheng, a professional calligrapher. He entered the calligraphy arena very early and showed excellent talent in pen and ink. He is talented and ambitious, which makes him handy in the practice of practicing inscriptions. With strong concentration and persistence, he has become one of the best calligraphers in the tradition after 60 years of study. What is more valuable is that his calligraphy inspired from the study of inscriptions in Qin and Han dynasties, and he also made great efforts to explore forward. He thoroughly understood the simplicity and sincerity of Oracle bones and tortoise shells in the pre – Qin period, as well as the opening of the stone drum of Zhong Ding. 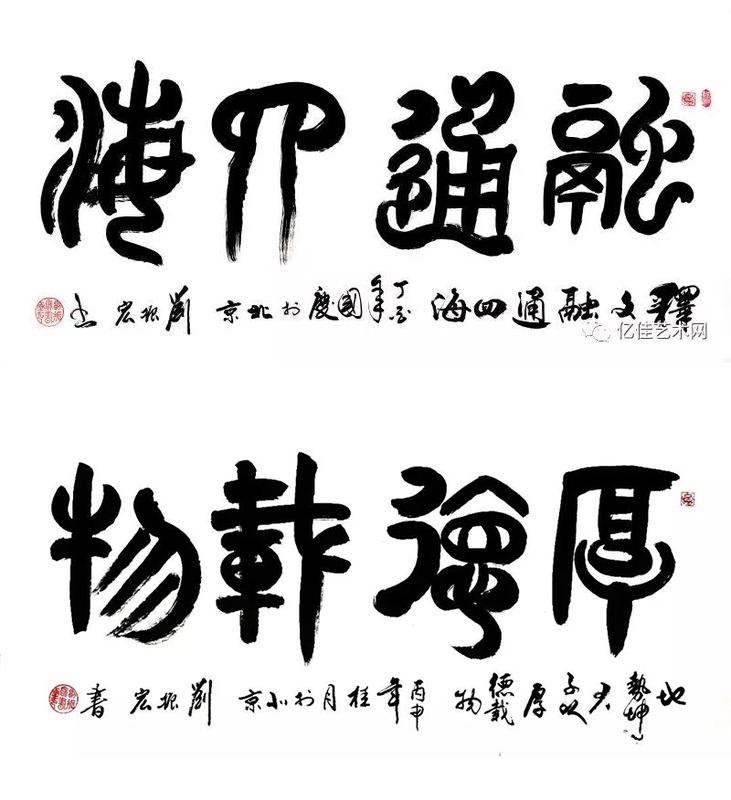 Calligraphy originated from the cultural source of the pre – Qin period, and when writing with ink, it is naturally formed a large bearing with elegant classical roots. This is Liu Zhenhong’s calligraphy at first sight, which is also the important reason why he always feels rich cultural and historical feelings in his works. 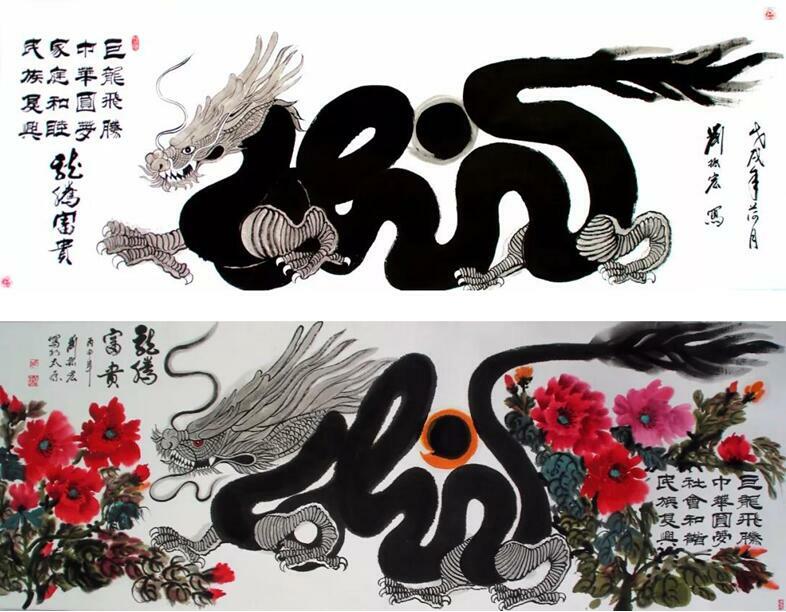 If calligraphers can follow his example and go so far in exploring the source of calligraphy, then the light floating and superficial shortcomings of calligraphy can be eliminated and the true style of calligraphy can be fully displayed. Calligraphy training has a strong ability to learn from the ancients, so the tone and rhyme of the inscriptions will inevitably take the form and implication of the dual realm. 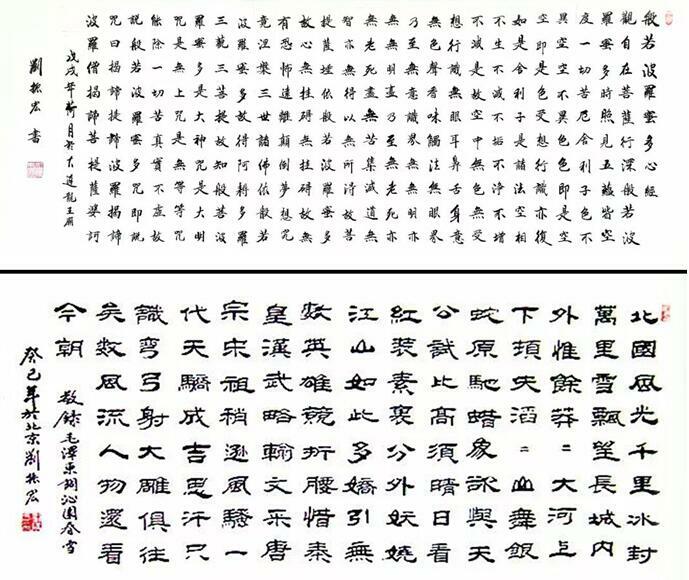 His official script followed the unique style of the Han tablet, showing strength with steel and ease with roundness, thus becoming a model of merging the two styles. Generally speaking, it is not difficult to write elegant rhymes with a round pen in calligraphy, but the square calligraphy requires the artist to have the talent to understand the quality of the tablet. It is easy to write a round and difficult to write a square. This is why calligraphy is more softly attractive. Liu zhenhong’s ability to express square and round’s method in calligraphy is obviously an achievement based on his deep cultivation and appreciation of his official script’s re-perception of Han rhyme. One can feel the uniqueness of his official script. One can feel the strength of the ritual tablet, refer to the grandeur of the Hua Mountain tablet, and then take the ease of Shi mensong. All the tablets can combine skills. One can see at a glance the realm of this skill in history. In the contemporary calligraphy world, regular script is weak. Many calligraphers don’t revise regular scripts, and the result of taking over cursive scripts is that there will be more abnormality in pen and ink. Although Mr. Liu Zhenhong knows that regular script is difficult to study, he is not afraid of extraordinary difficulties. He uses his will to dye through the pool and wear tens of thousands of pens. He strives to achieve good results in the regular script. The small script is hand-written with heart sutra, delicate and elegant, Zen style and rhyme interpretation. The regular script has Liu’s structures and Yan’s strengths. He also agrees with Zhao Ziang’s method of “regular script stippling with a little care”. Under the support of the rule, regular script is most vivid. This is obviously the beauty of regular script and the true work of calligraphy circles. Square and round complement each other skillfully, reaching calligraphy realm of great achievements. Thanks to the superior support of regular script skills, his calligraphy has advanced to two courses of cursive and cursive. This is natural and unrestrained. Writing running script follows ” Preface to Orchid Pavilion” as the standard copybook, taking the meaning of the Jin Dynasty and the Song Dynasty, changing the writing style of flowing clouds and flowing water, making the cliff stand green and bamboo drunk and lyrical, taking the meaning of the calligraphy and showing the great achievement of the realm, which is amazing. His cursive script comes from the techniques of Zhang Cao and the style of today’s wild cursive. He can wield a pen like a dragon, write with ink, write with phoenix, express emotion, and show everyone’s skill all the time!